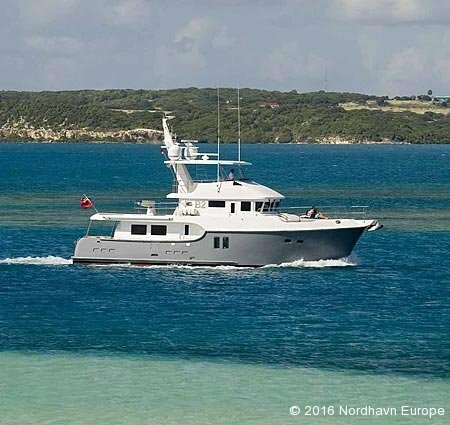 After introducing the NORDHAVN 55, which closely followed the successful launching of the new 43, 47 and 72, Pacific Asian Enterprises (P.A.E.) 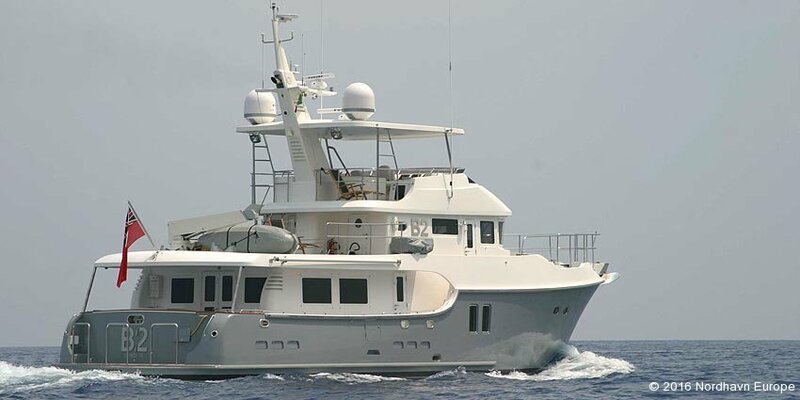 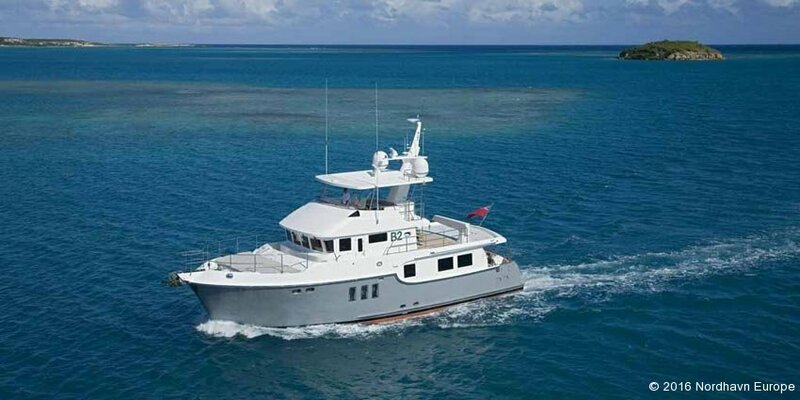 continues to strengthen its leadership position in long range, full-displacement passage makers with the NORDHAVN 64. 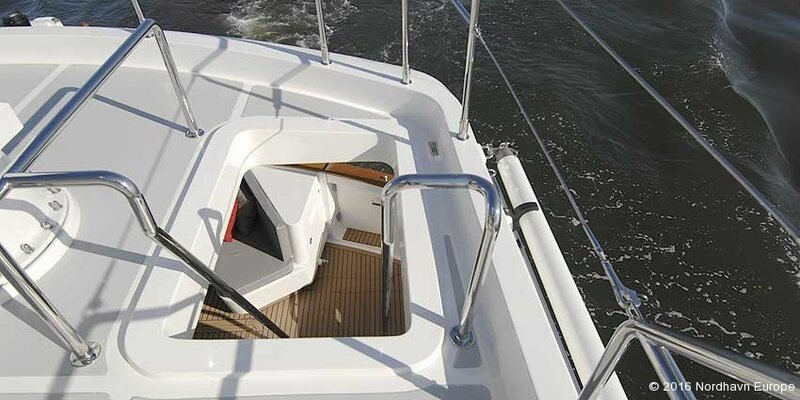 The generous interior volume is made possible by the relatively high bow and extra freeboard of the overall design. 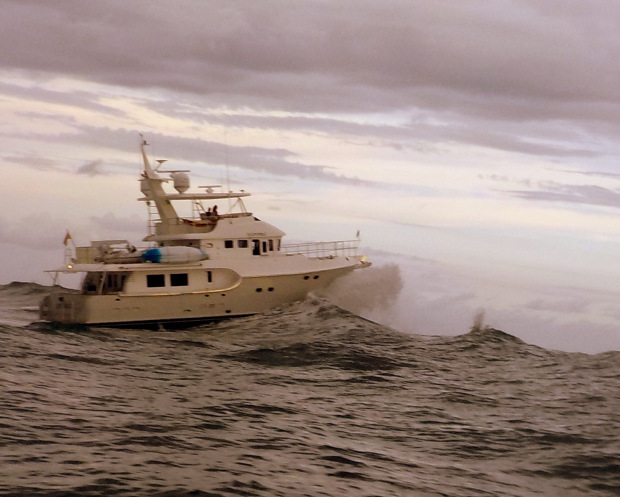 After extensive tank testing and actual sea trials of its various models, P.A.E. 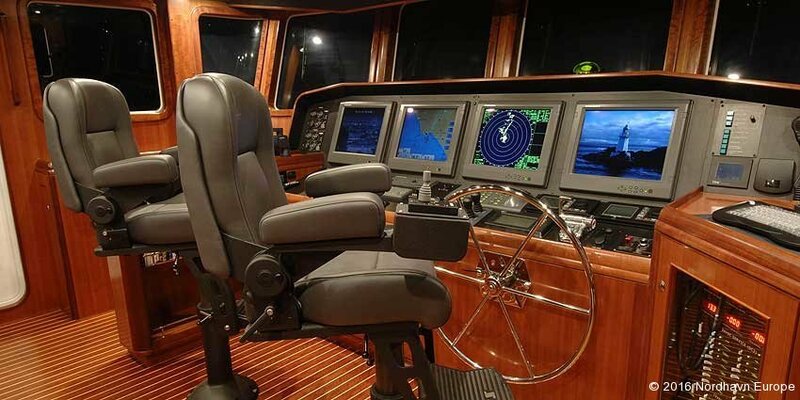 determined that there is no downside to adding more freeboard to its designs as long as weight is kept low. 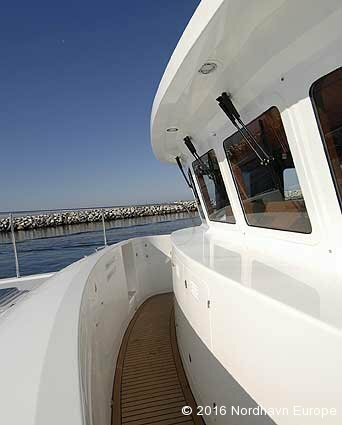 “Of course aesthetics are an issue with extra freeboard, but when we get into the 60-foot range, there is enough length to give the boat a very attractive profile,” Leishman said. 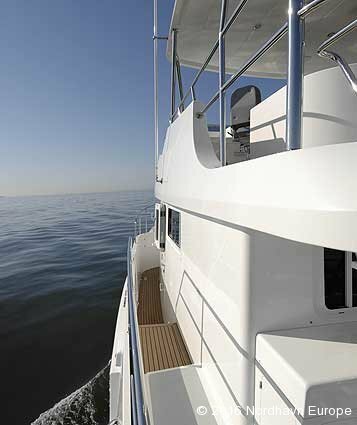 Beyond the obvious advantage of providing more volume below, there are sea-keeping advantages to the high bow and deck level. 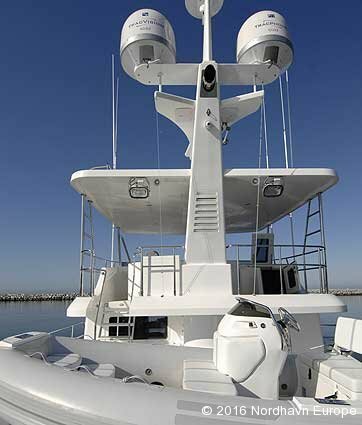 The bow provides extra buoyancy when punching into large head seas, and the deck takes on less green water in high seas. 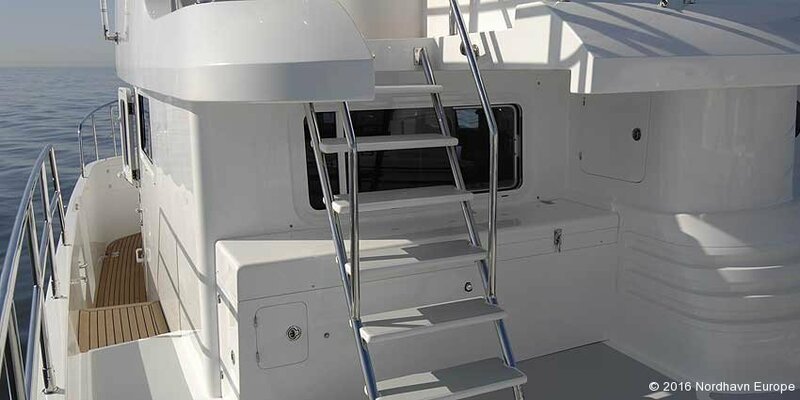 Because the added height provides more volume below the cabin sole, the engine, fuel tanks and water tanks are positioned very low, ensuring superior stability. 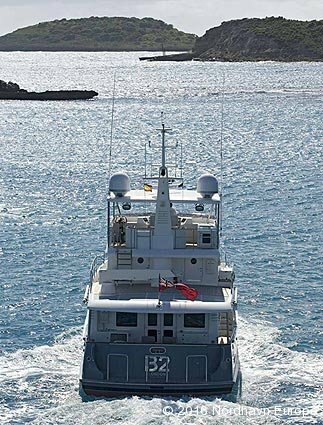 P.A.E. 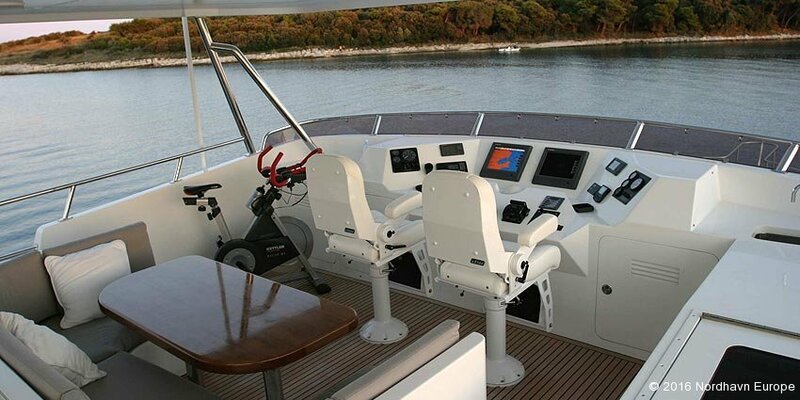 is able to use its bulletproof ‘gravity feed’ fuel system, which has proven to be extremely reliable and easy to use. 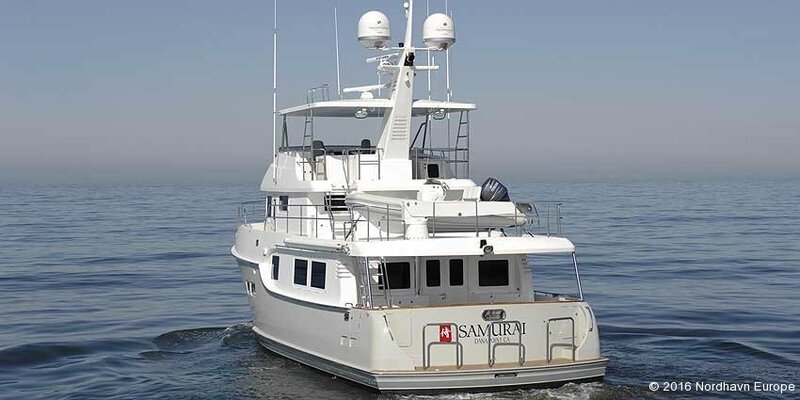 Corrosion-free fiberglass fuel tanks feature human-sized inspection plates, adding to the trouble free, long-term service of the vessel. 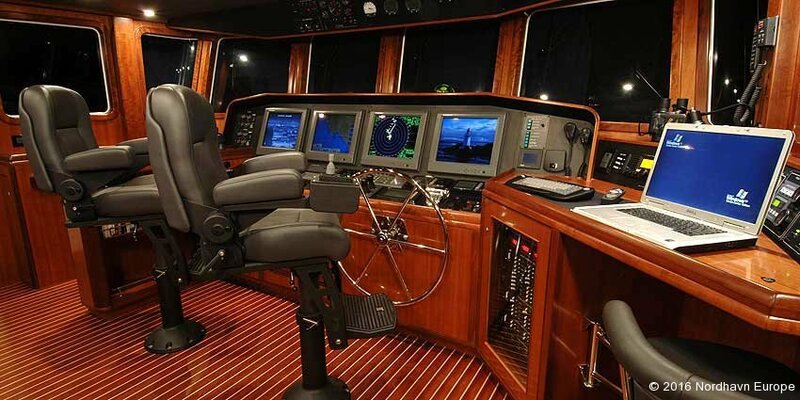 As with all Nordhavns, the main saloon opens directly to the aft cockpit, effectively expanding the living area to the outside. 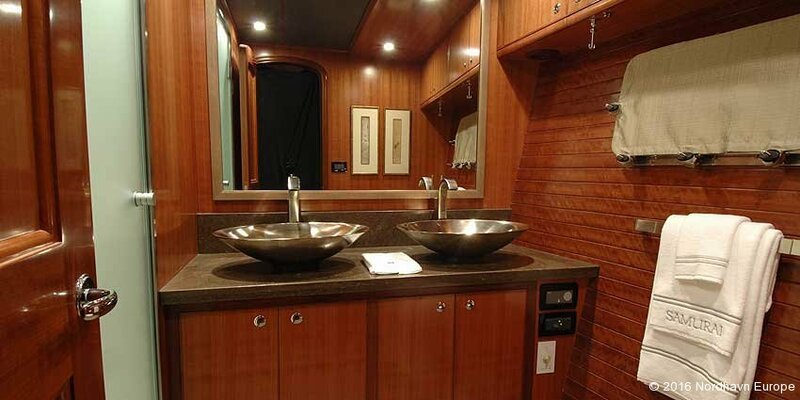 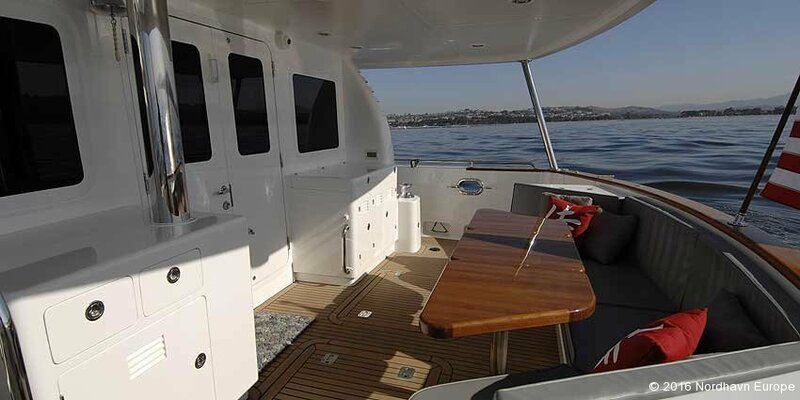 The asymmetrical cabin allows for a wider main saloon and features a wide side deck on the starboard side. 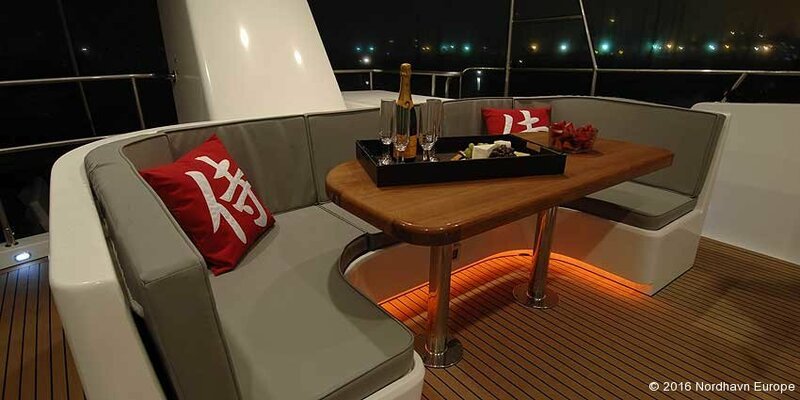 There are two seating areas featuring settees and tables as well as a large lounge chair. 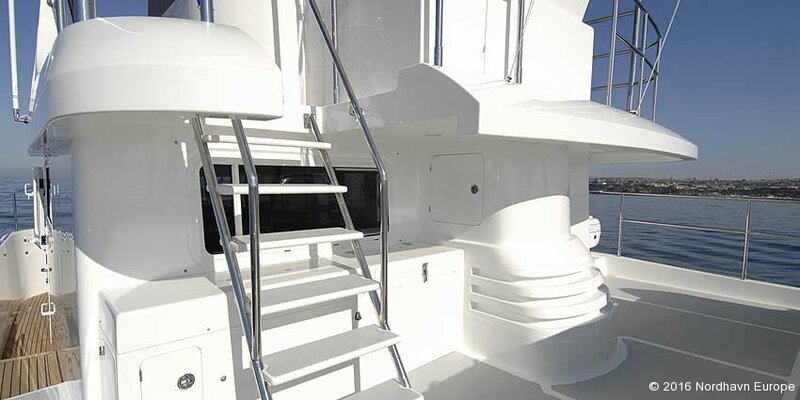 An optional 42” plasma TV can be installed on a hide-away lift system (standard), as well as an optional Bose sound system for optimal entertainment. 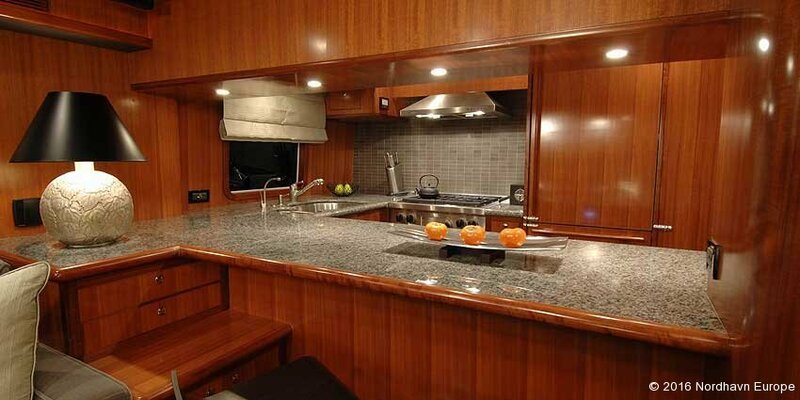 Three bar chairs face the pass-through countertop in the galley, which is just forward of the saloon. 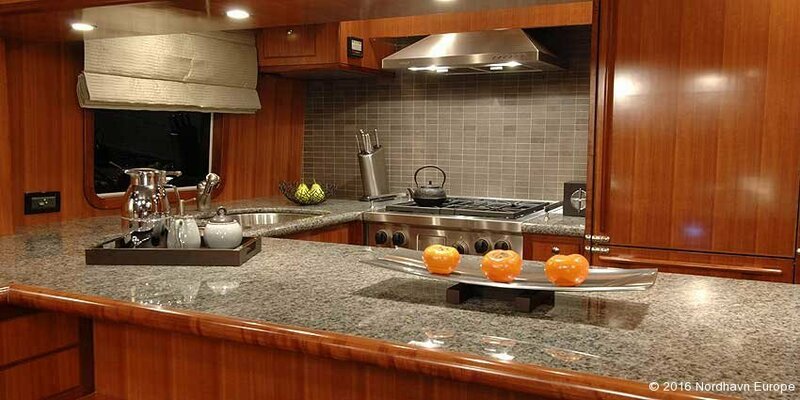 The galley rivals today’s finest gourmet kitchens with its full-sized home-style appliances, abundant storage cabinets and generous counter space. 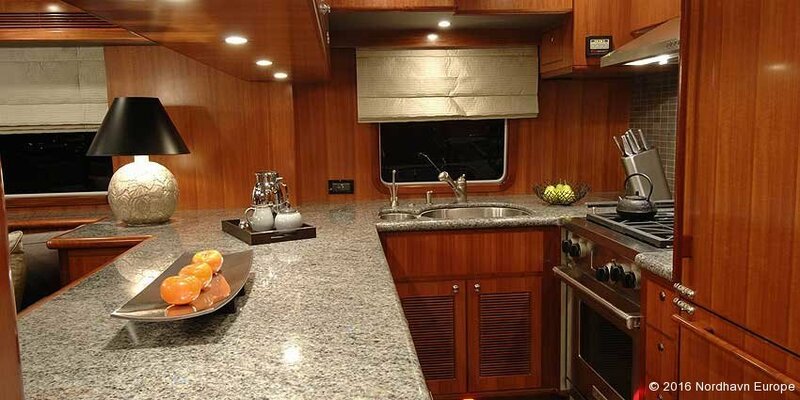 Standard equipment includes a Sub Zero side-by-side refrigerator/freezer with icemaker, a 4-burner General Electric (GE) stove and oven, a GE microwave/convection oven, a GE trash compactor, Miele dishwasher and two (2) U-Line front-load freezers in the utility room. 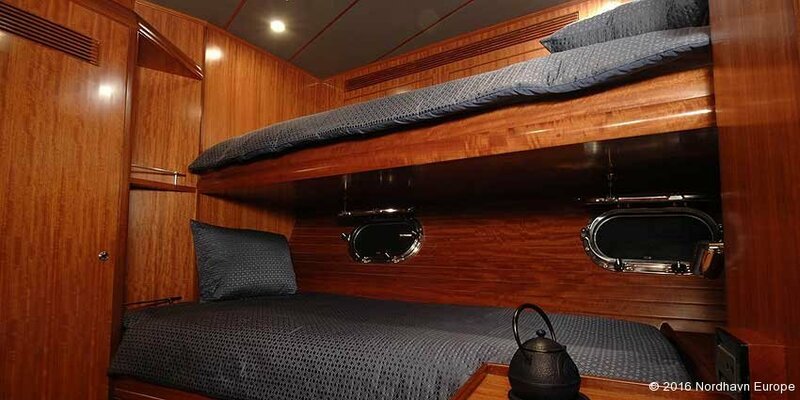 The owner’s stateroom is located amidships, where the motion is minimal during passages and at anchor. 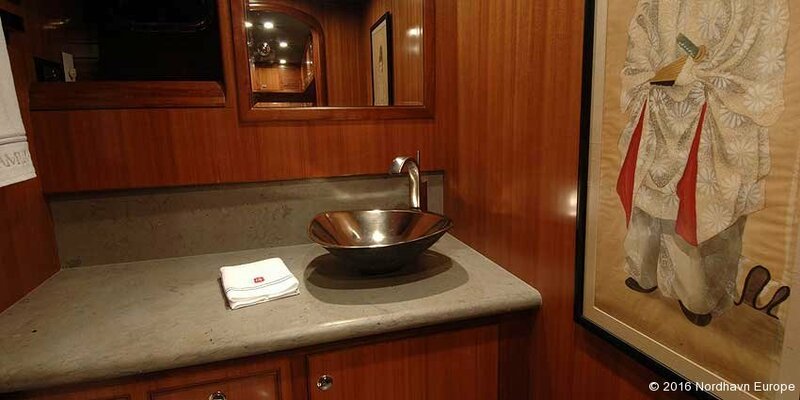 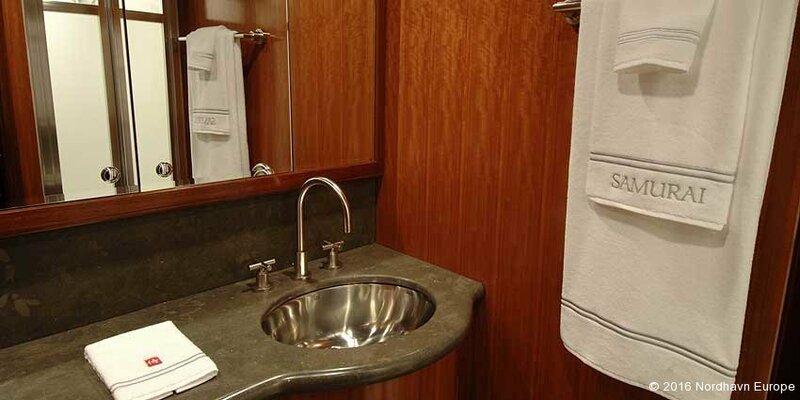 A king sized, walk-around berth, two huge hanging lockers, a desk area and a master head finished with a tiled sole competes with the finest hotel suite. 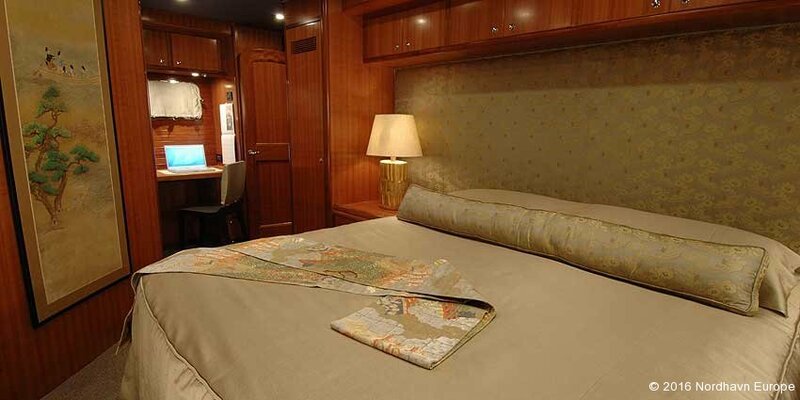 The two guest staterooms forward, one with a double berth and one with twins, share a large head. 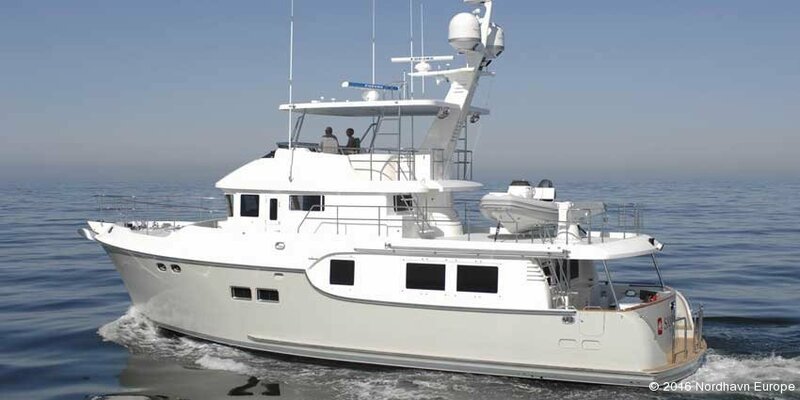 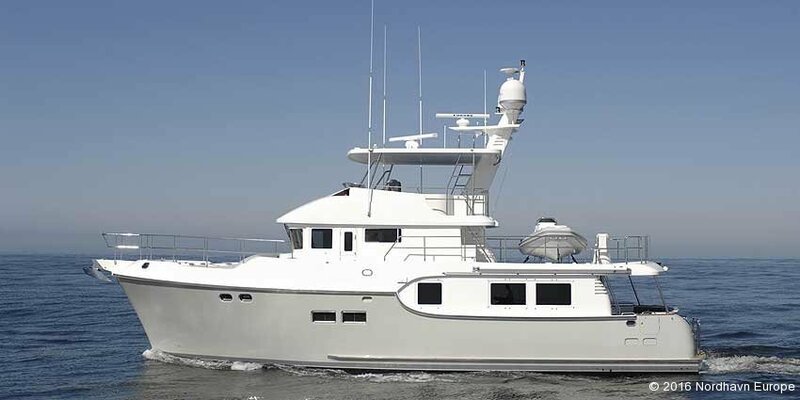 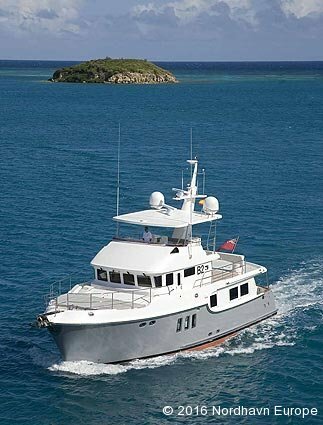 The Nordhavn 64’s commercial-like pilothouse is located amidships for minimal motion at sea and provides excellent, 360-degree visibility. 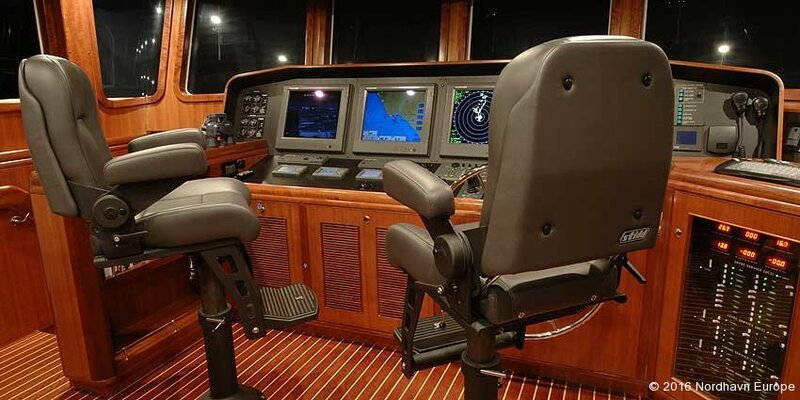 Two full-sized helm chairs put the captain and mate comfortably in command of their ship, with all electronics and controls within sight and reach. 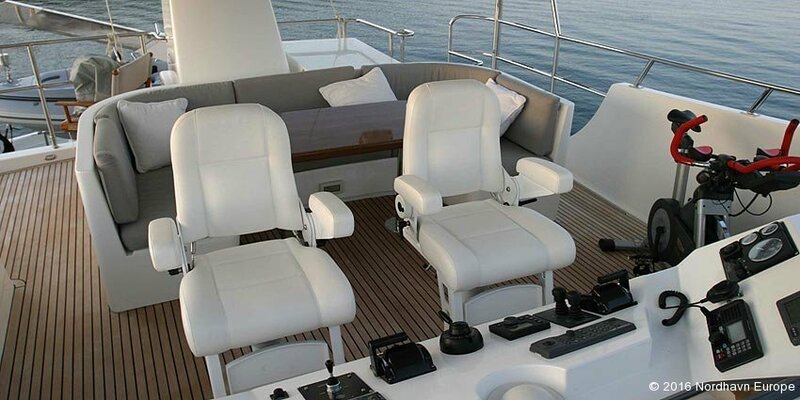 Aft of the helm chair, a settee and table, elevated for superior visibility, will seat four crewmembers. 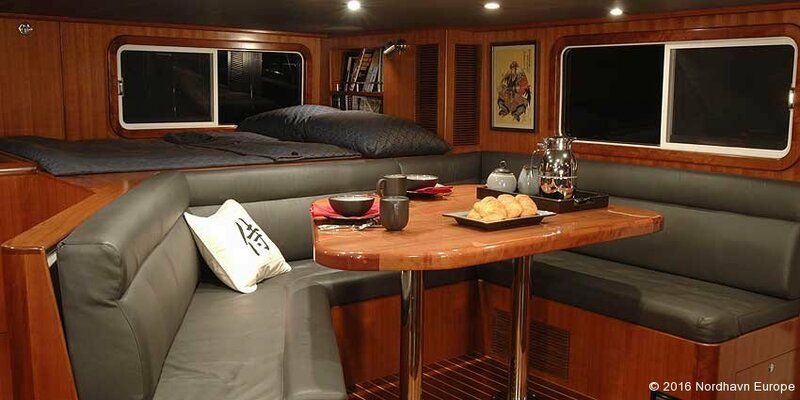 Beneath the settee are full-sized chart drawers and additional storage. 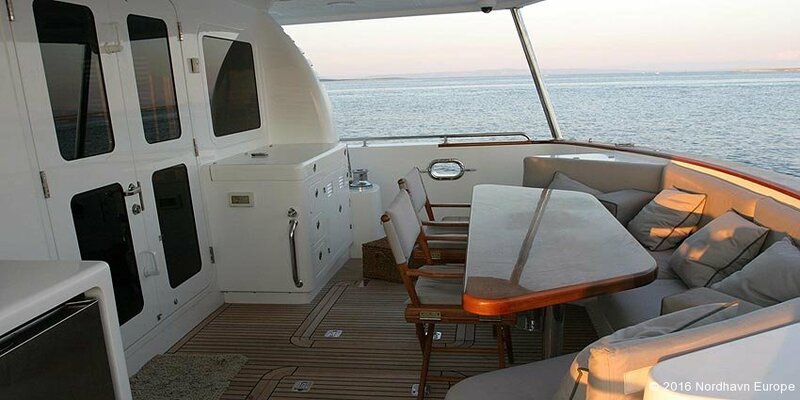 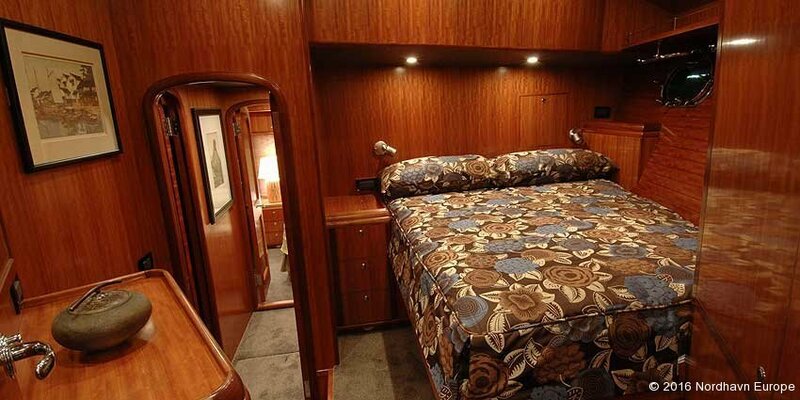 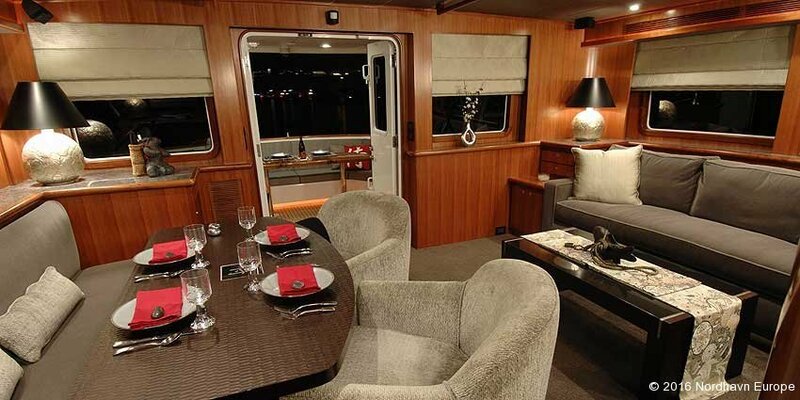 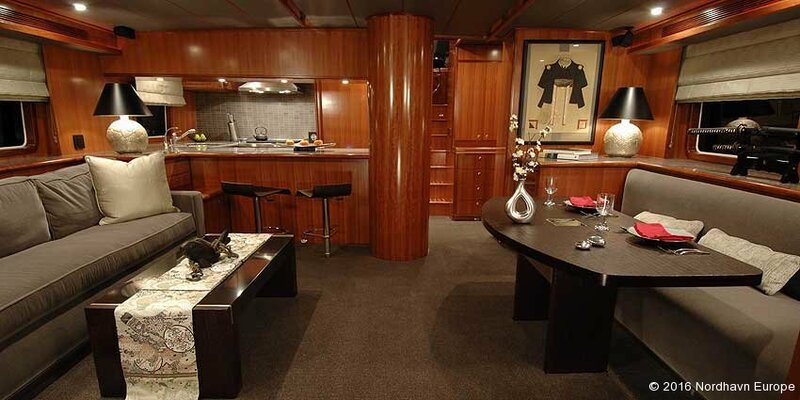 Above and aft of the settee is a double-sized pilot berth, perfect for the off-watch crew on long passages. 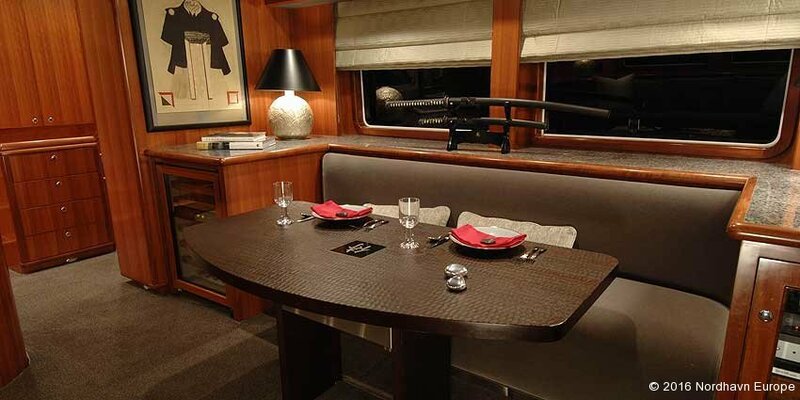 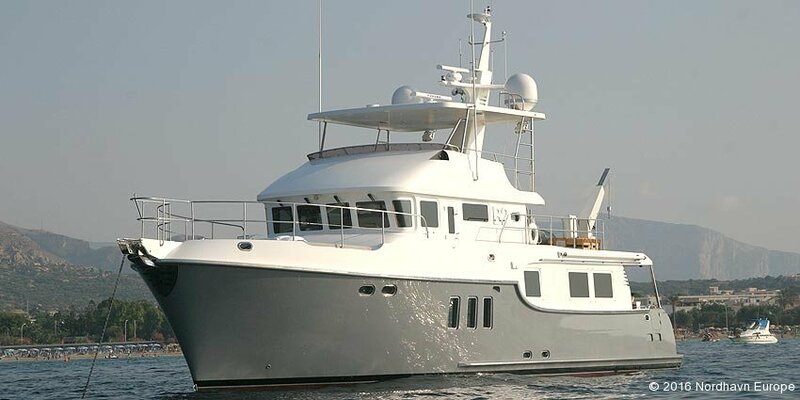 The standard Nordhavn 64 is provided with a spacious flying bridge. 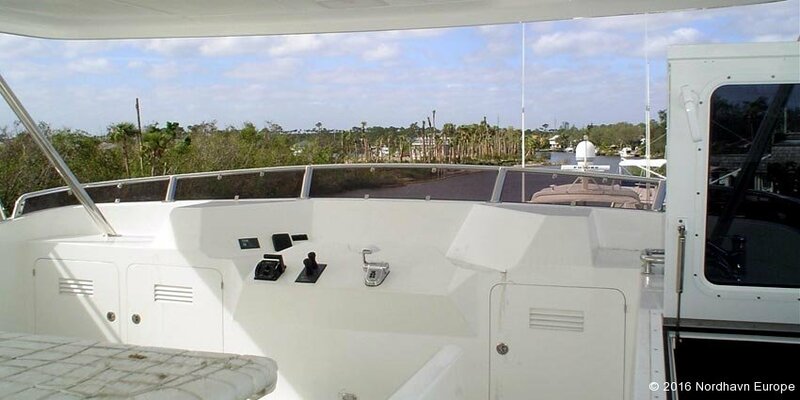 Located directly over the pilothouse, it will be the social center in fair weather. 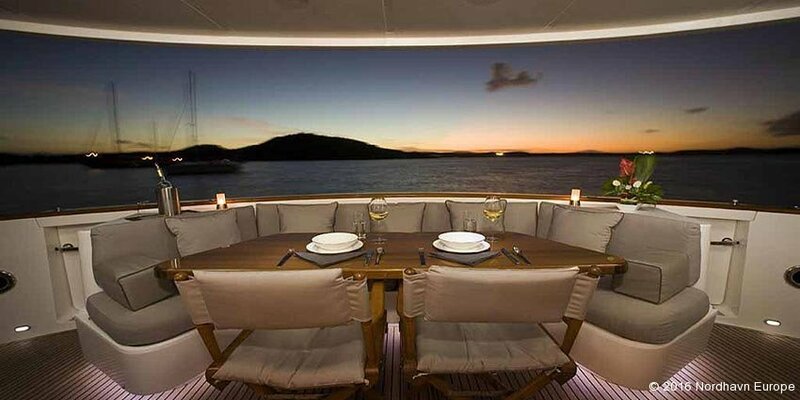 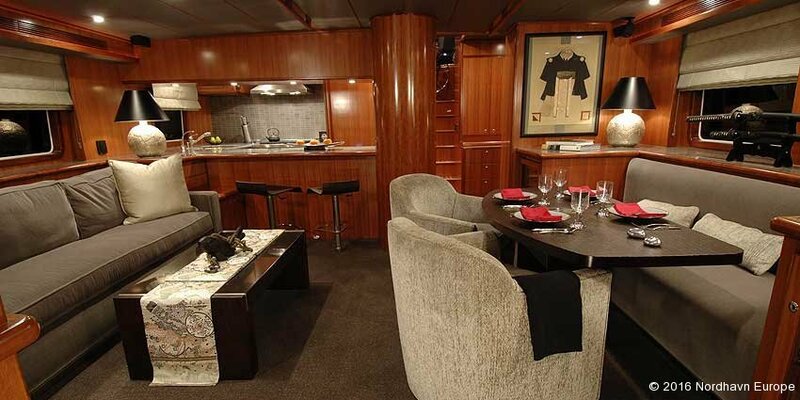 The flying bridge is equipped with a U-shaped settee and table seating four, a Norcold drinks refrigerator and a Stidd helm seat. 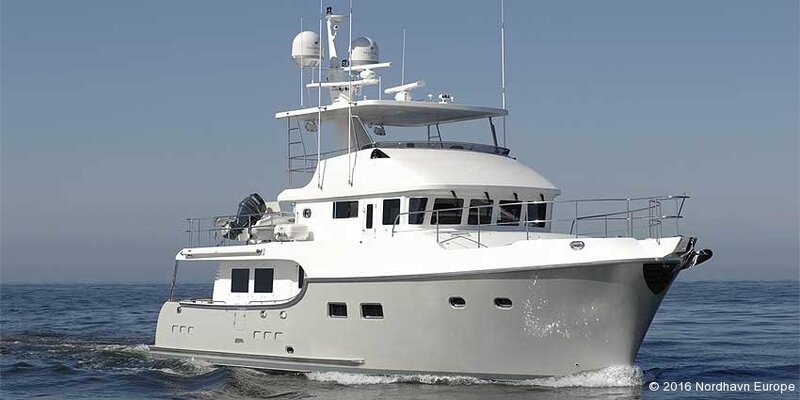 With a waterline of just under 60-feet, the Nordhavn 64 has a high cruise speed of 10.5 knots under full load conditions. 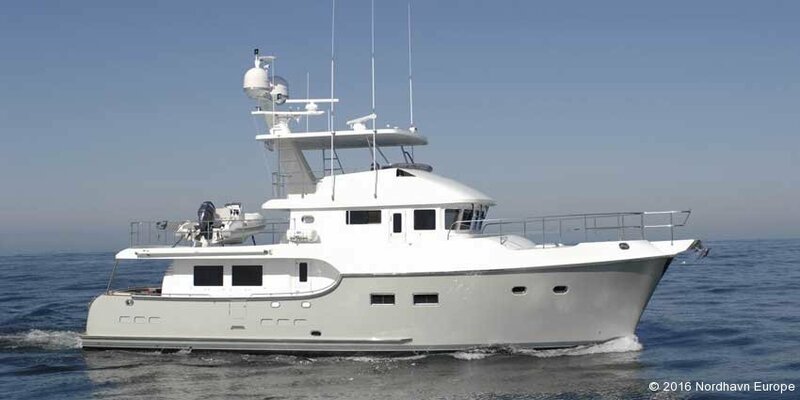 At this speed, she has a range of 1600 nautical miles. 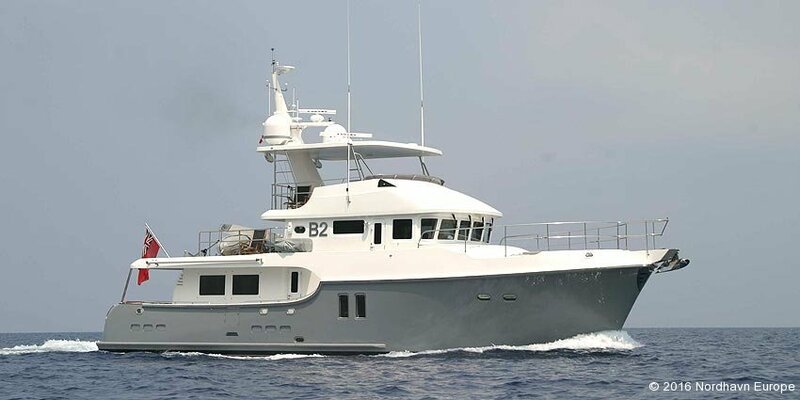 At 9 knots, her range increases to nearly 3,000 nautical miles. 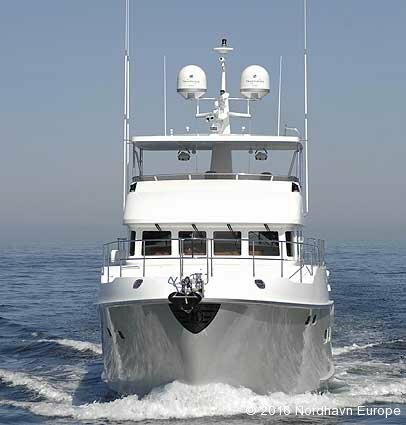 Her hull form, a refinement of Nordhavn’s MFD (Modified Full Displacement) design, features fuller aft sections that reduce “squatting” and pitching motion while increasing static stability. 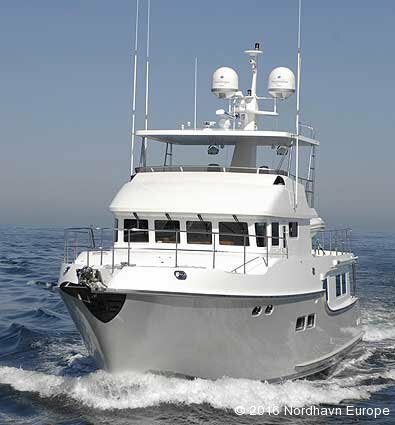 Main propulsion is provided by a John Deere 6135AFM 425 hp diesel engine that turns a 3 1/2-inch Aquamet shaft via a 3:43:1 reduction Twin Disc transmission. 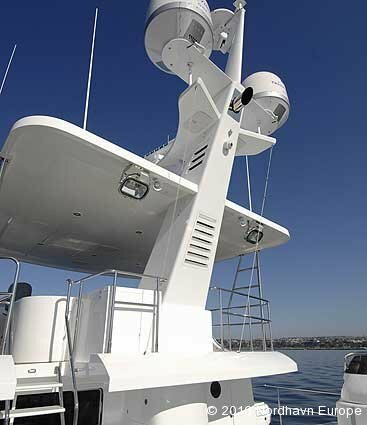 This amount of reduction allows the 44″ prop to turn slowly, greatly reducing noise and vibration. 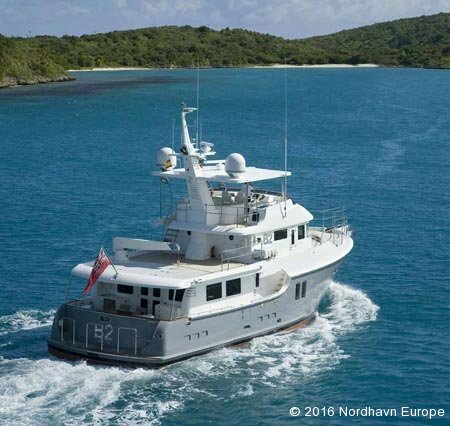 A dry exhaust, a signature design element of most Nordhavns, eliminates the need for a large through-hull and raw water pump, greatly reducing the risk of failure at sea. 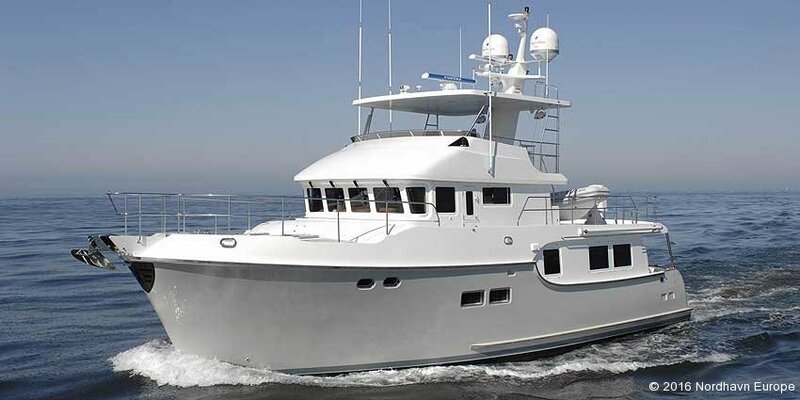 A John Deere wing engine with its own shaft, folding prop, fuel system and battery is designed to move the N64 at 4-5 knots in normal conditions and to make headway in rough seas should an emergency cause a loss of power from the main engine or power train. 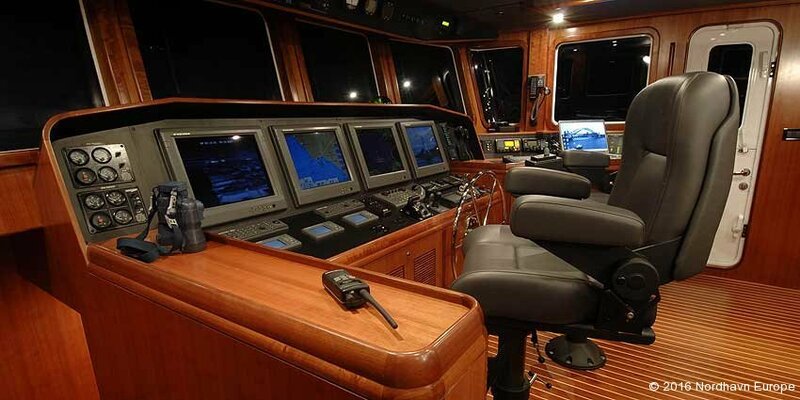 This “get home” system has proven to be the most foolproof of all types of systems used for this purpose, and it has become a signature feature of Nordhavns. 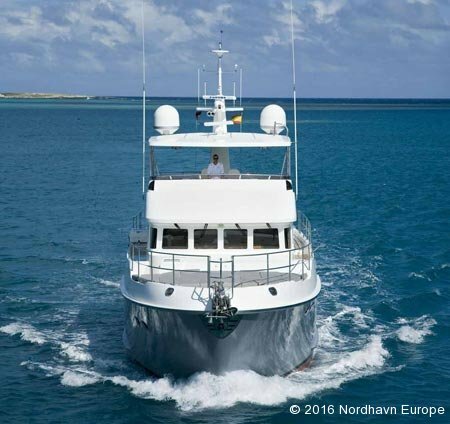 The Nordhavn 64 is packed with superb equipment and features and is built to exquisite quality standards. 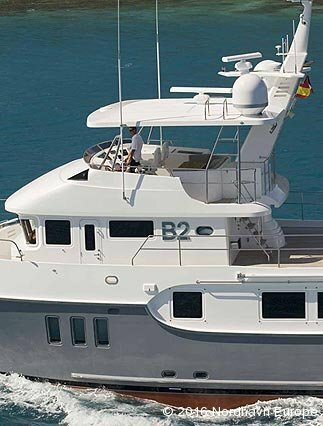 Included in the base price are items such as ABT stabilizers, bow and stern hydraulic thrusters, davit with power rotation, wing engine, elegant appliances and fixtures, granite counter tops, 27.5 KW generator, two inverters, air conditioning, back-up systems, an anchor system and much more. 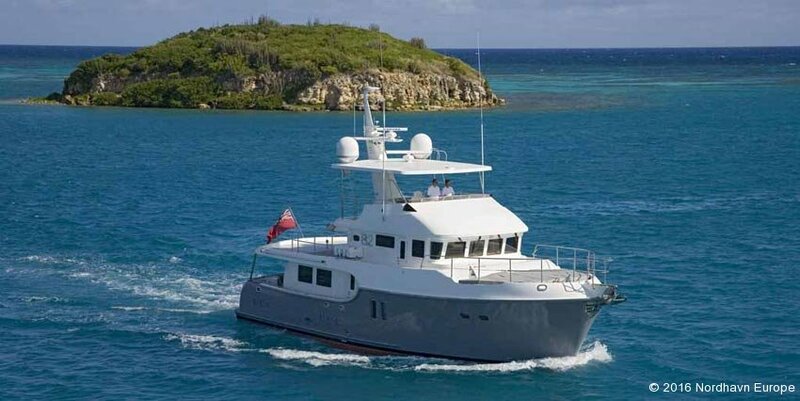 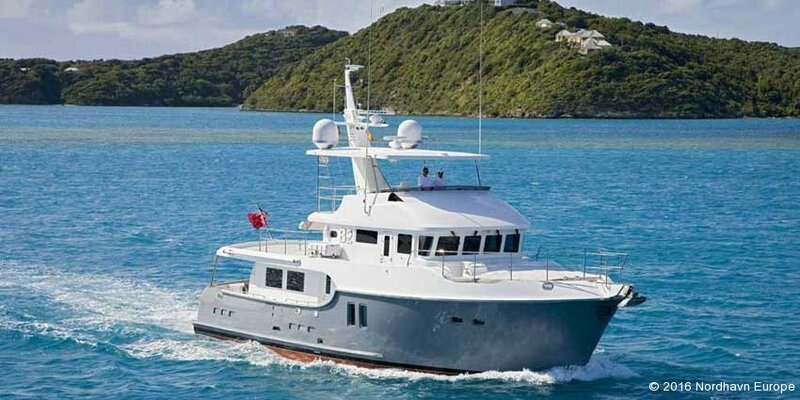 The Nordhavn line of long-range cruisers, of which there are now seventeen models between 40 and 120 feet, is built by a select number of premium yards throughout the Far East, all closely supervised by Pacific Asian Enterprises personnel. 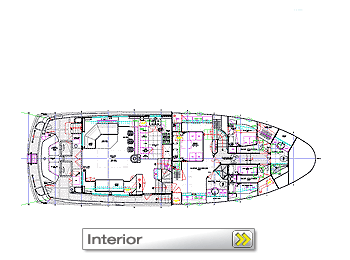 Hull lamination schedule per construction plan. 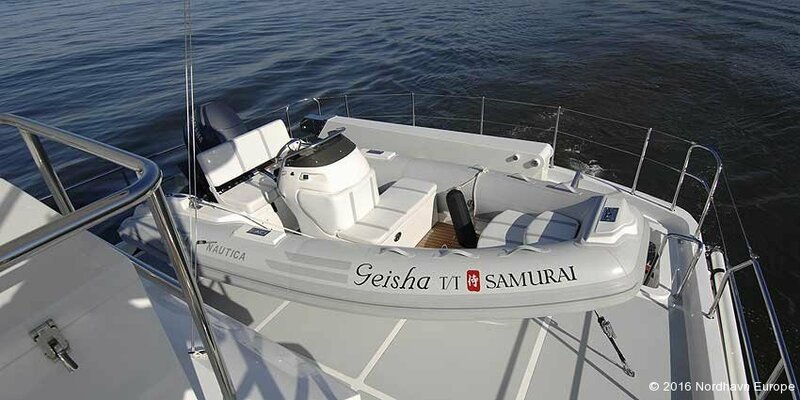 The area below water line to use “Isophthalic” gelcoat and vinylester resin for the first three (3) layers. 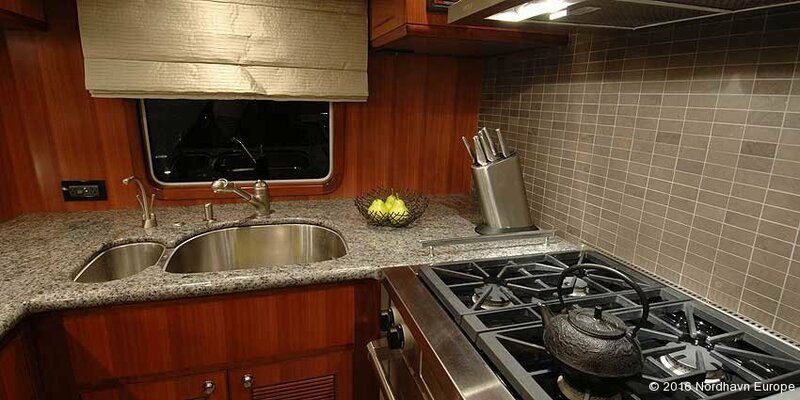 The hull lamination will use “Combomat” in lieu of standard M+WR. 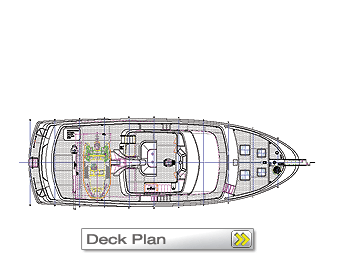 Deck lamination schedule per construction plan. 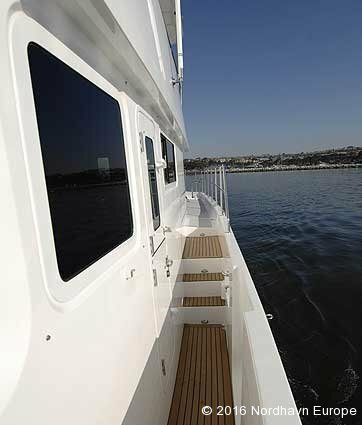 “Cymax” fiberglass will be used for all deck lamination. 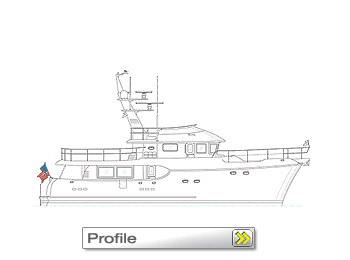 Dry exhaust system: 6″ (15.2 cm) I.D. 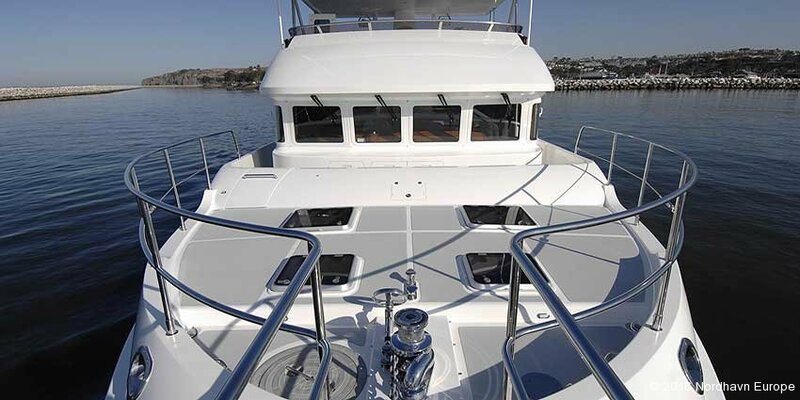 Vent lines to be fuel certified, reinforced hose 1” (2.5 cm) I.D. 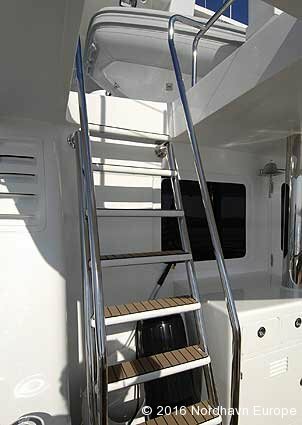 Fitting provided for deck pump out.